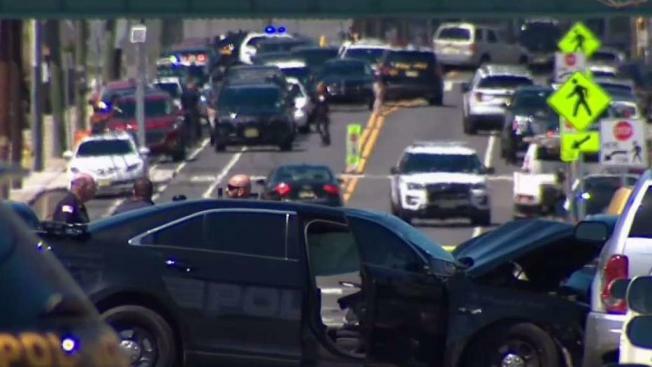 A police officer crashed into a parked car in New Jersey on Sunday and died, officials said. Paterson police officer Tamby Yagan was on-duty in a marked patrol car when he crashed into a parked vehicle, the Passaic County prosecutor's office said. The crash was on Getty Avenue just before 11 a.m.
Yagan was taken to Saint Joseph's Medical Center, where he was pronounced dead, prosecutors said. Paterson Councilman Luis Velez said losing Yagan is a heavy "loss for the city." "In uniform he was the type of officer that would always orient people how to conduct themselves out there," Velez said "Without uniform he was a kind man." No one else was injured. Yagan leaves behind a young son. State police and prosecutors were investigating. Officials said it's unclear whether the officer died as a result of the accident or from a medical emergency. The Passaic County Sheriff's Office and the New Jersey state police union tweeted condolences to the Paterson Police Department and the officer's family. The Sheriff Berdnik and the members of the PCSO would like to extend thoughts and prayers and our sincere condolences to the entire Yagan Family, Paterson Police, and many others who experienced today's tremendous lost.